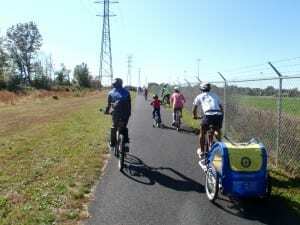 On Sunday, April 26, 2015, at 1pm the WWBPA Student Advisors will be leading a bike ride for anyone 12 years or older beginning at the East Parking Lot along Edinburg Rd in Mercer County Park. 13 or 19 mile roundtrip options. Check in at 12:45pm. Bike Ride 1-3pm. Free event. No pre-registration required. Helmets and a functioning bicycle are mandatory. 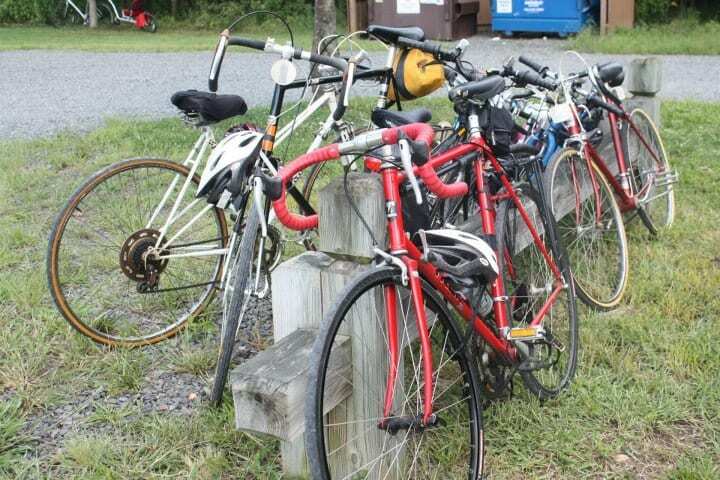 Organized by the West Windsor Bicycle and Pedestrian Alliance. Please fill out and print the waiver. Anyone under 18 must have the waiver signed by a parent or guardian. Please welcome Jim Angelus as our guest commuter this week – if you’d like to share your commuter experiences, contact wwbikeped@gmail.com. Everyone has an experience that births the compulsion to begin and end the work day on a bicycle. Until ’98, my commute was limited to the overcrowded and undersanitized Lexington Avenue line in lower Manhattan. I was born in the city and lived there for 35 years commuting to ad agencies, where I was a creative director. 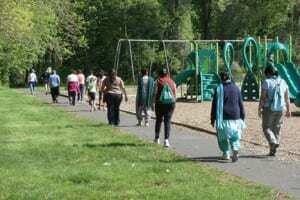 Living in Hopewell 20 years later, a stark contrast – I rise at 6, am out the door at 7. It wasn’t until taking *mandatory* retirement from my marketing job at Merck that cycling took over. It was 2001. I was out of a job with newly born twin boys; retirement at 45 not an option. Time to redirect, refocus, narrow down, be practical, and use time wisely. 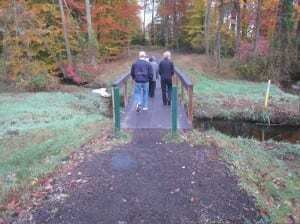 I had been cycling the Sourlands, up through Frenchtown, Holland, and Lebanon townships trying to plan next steps. Fortunately, logic and sound thinking didn’t reign – however, a self-absorbed plan to cycle cross-country with a close friend in ’02 did. This 3,215 mile/25 day ride from Point Reyes, CA to Keyport, NJ was the perfect gestation cycle that gave birth to the “third wheel” in my marriage. A decade later in ’12, my German friend joined me once again, as we cycled from Seattle, WA to South Seaside Park, NJ – 3,300 miles/37 days later. 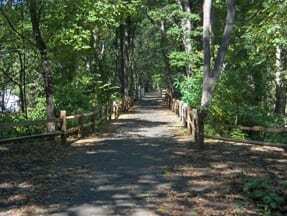 Today, I ride to work in South Brunswick, on Rte 518 into Rocky Hill, up the hill by the quarry to Rte 27. My ride home varies as does my mood. Sometimes a detour up Lindbergh Rd, other times Aunt Mollie Rd serves me well. Decisions! Decisions! My single speed wheels are picky and I must keep them happy. A version of this post appeared in On the Move, the blog for the Greater Mercer Transportation Management Association. Please join us Saturday, February 25 at the West Windsor Arts Center to see an exciting documentary of an informal mountain-bike race from Canada to Mexico along the Continental Divide trail. 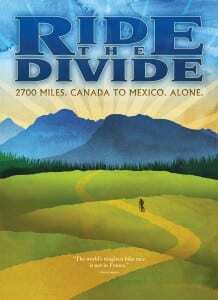 The film, Ride the Divide, weaves the story of three characters’ experiences with immense mountain beauty and small-town culture as they attempt to pedal from Banff, Canada to a small, dusty crossing on the Mexican border. Tickets are free for members, $5 for nonmembers, and admission is on a first-come, first-served basis. Members can help with set up starting at 6:30pm, and the box office opens at 7 p.m. The film starts at 7:30 p.m. Free parking is available a short walk away at the Wallace Road lot by the station. Please join us for discussion and light refreshments afterward. And yeah, we’d really appreciate your help cleaning up. The West Windsor Arts Center is located in the historic Princeton Junction Fire House at 952 Alexander Road, at Scott Avenue. This is a great time to renew your membership, if you haven’t done so already. Hope to see you there! Let’s take a break from all this focus on infrastructure and let me share the story of how I came to enjoy biking and walking. I learned to bike as a small child in a small town in the midwest in the 1960s, which was surrounded by open space. As kids, we biked and walked to school, raced our bikes around the basketball hoops on the playground, and rode the trails through the woods, all on a banana-seat bike with knobby tires. Later, we rode motorcycles and snowmobiles on those same trails, as well as walked and cross-country skied them. I bought a 10-speed from Sears with my paper route money while in junior high school. With friends from scouts and school, we’d backpack overnight or all week, sometimes in winter with cross-country skis, and once we loaded the camping gear onto the bikes and did a weekend out and back via bike. After learning to drive, we moved on to longer backpacking trips, including a 6-week trip to Wyoming with a school friend, and learned to rock and later ice climb. Any excuse to travel was good enough – my college roommate and I took a 6-month European rock and ice climbing trip, with an interlude traveling via rail pass. I moved to the east coast after college and bought a touring bike with high hopes, not realizing how little time there is for fun once you start working full time. My wife and I canoed and camped together, and cruised our sailboat after the children arrived. I did my best to introduce all the outdoor activities I love to my son’s scout troop and later to my daughter’s Venture Crew (a co-ed scout group). My long term backpacking project is to hike the entire Appalachian trail in sections – so far, I’ve done almost 1300 miles out of about 2200. Biking for me is mainly recreational – I bought a road bike after failing to keep up with my neighbor on a ride in the early 1990s, and still ride it today. 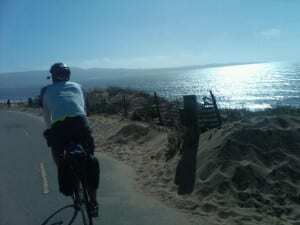 Besides errands and recreational riding with the Princeton Free Wheelers, I’ve done several week-long charity rides for Anchor House, plus a self-supported camping tour from Oakland to Los Angeles. Hope you enjoyed my story – do you have a story you’d like to share? Please send us an email at wwbikeped@gmail.com, and we’ll be happy to post it here. 43 people enjoyed a nice ride on a beautiful fall day, a little over 5 miles round trip from Community Park to McCaffrey’s and back. Thanks to everyone who participated, including our WWBPA trustees, student advisers and volunteers who planned, led and directed the bicyclists, and even handed out a few bandaids, and special thanks to McCaffrey’s for donating the refreshments! The fall colors were out in full force (see our facebook page for more pictures) and we enjoyed the Trolley Line Trail as well as the bike lanes on Rabbit Hill Road and Bennington Street. Also appreciated were new high visibility crosswalks at Davenport and Southfield Road by the shopping center. We also saw a policeman patrolling the Trolley Line Trail on motorcycle. The group included all ages, from those enjoying a ride in a trailer to us older kids (at heart), and split into 3 smaller groups pretty quickly – the fast group led by the speedy student advisers, a middle pack of family members, while the last group comprised those with the smallest bicyclists. We got a number of positive comments, including a request to do this more often. With the new bike lanes on Village and Penn Lyle, we have more routes to choose from, thanks to the township and county. 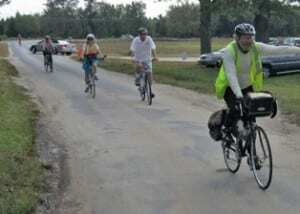 The 2011 Tour de Pines, sponsored by Pinelands Preservation Alliance, celebrates Pinelands Month in October with five consecutive single-day bicycle tours of the New Jersey Pinelands. The aims are to highlight the natural and historic features of the one million acres of the Pinelands and to encourage New Jersey residents to get out and explore this unique environment. The Pinelands, an area of 1.1 million acres in our densely populated state, is the largest surviving open space on the eastern seaboard between the northern forests of Maine and the Everglades of Florida. 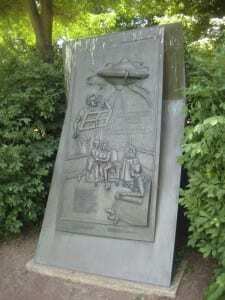 Ghost towns, historic sites and legends such as the Jersey Devil preserve the Pinelands’ unique culture, telling the many stories of how humans have used and depended on the natural world around them. The 2011 Tour de Pines will begin on Wednesday, Oct. 5 at PPA’s Bishop Farmstead in Southampton Township, traverse the length and breadth of the Pinelands National Reserve, and culminate at Whitesbog Village on Sunday, Oct. 9. Each day’s tour will range from approximately 40 to 55 miles per day, with average speeds of 11-13 mph, and begin and end at the same location. Registration deadline is Oct. 1. You don’t need to do all the rides. Plus it’s free! Just provide your own transportation, food and lodging as needed. 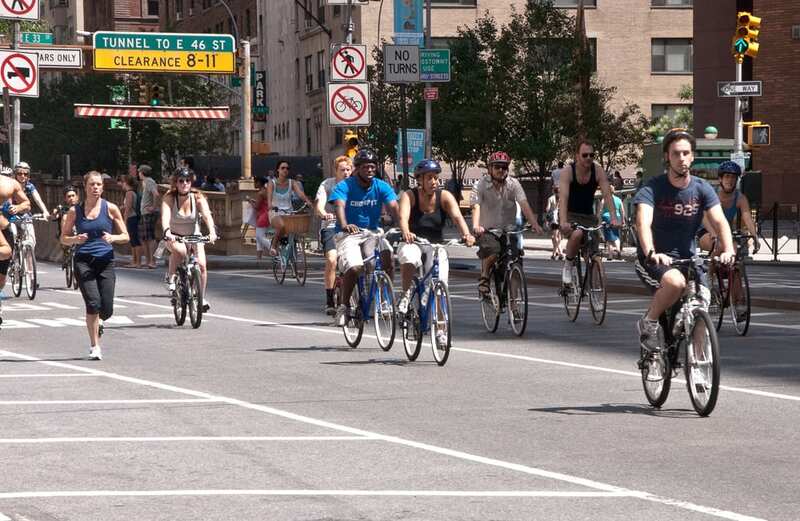 Head to New York City this Saturday, Aug, 20, for the last of its three Summer Streets festivals and experience the city in a totally different way. On these Saturdays, Park Avenue and connecting streets from Brooklyn Bridge to Central Park (including the underpass under Grand Central!) are closed to all motor traffic from 7 a.m. to 1 p.m. and are turned into a people-friendly venue on which to bike, skate, run, stroll and just hang out. 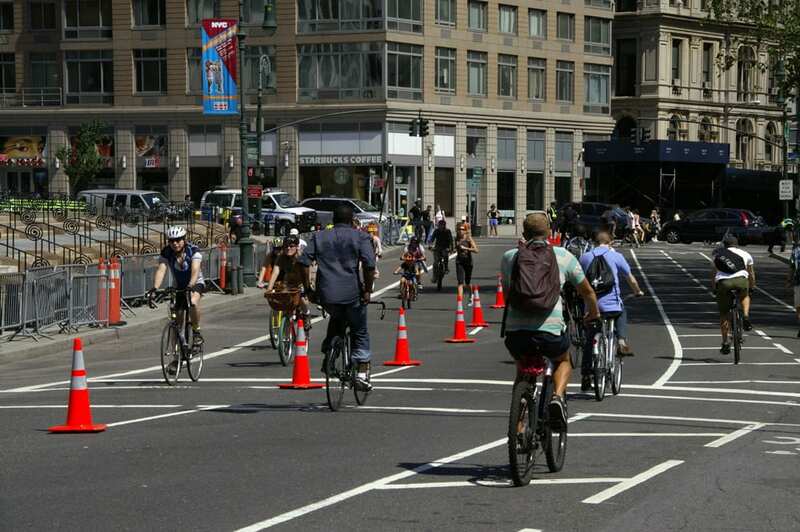 We first learned of Summer Streets four years ago when it began and have been returning each year for at least one and sometimes two or three events. 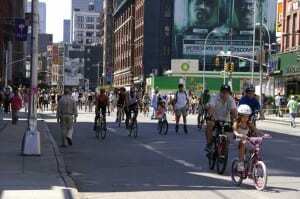 In 2010, we took the Staten Island Ferry with our bikes and joined dozens of others in a ride up the West Side bikeway and then across town to City Hall where we started up the route first on Lafayette Street and then onto Park Avenue all the way up to 72nd Street, where we headed west into Central Park. Along the way, we passed dance troupes, Juan Valdez and his burro at the free coffee stand, swimming pools made from large metal containers with a “beach area with cabanas” on the side, through the tunnel at Grand Central Station and on up to the park. 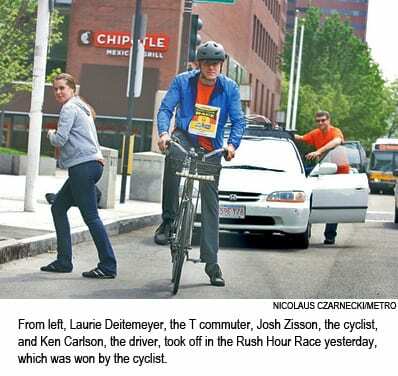 All manner of bike, tricycle and other people-powered vehicles wheeled gracefully uptown and downtown, and everyone– police officers, riders, joggers, and walkers–were in great high spirits and having a ball. After riding for a couple of hours, we dropped our bikes off at the Bike Valet around 23rd Street and headed into the “Picnic Area,” where Whole Foods had set up booths to dispense goodies from yogurts to gelatos, cheeses to juices and all manner of free yummies. As 1p.m. approached, we headed back to the West Side and rode back to the ferry and started the boat and car trip back to Princeton Junction. This year we decided to leave the bikes at home, ride the train in and take advantage of the “Free Bike Rentals” from Bike NY. We took our helmets and bike gloves in, as the thought of shared helmets was too much to contemplate. Once up from the depths of Penn Station, a brisk stroll east to Park Avenue got us to the pick-up station at 25th St. As we stood in line, we learned that the “free” portion is limited to 60 minutes, after which they charge $1/minute. 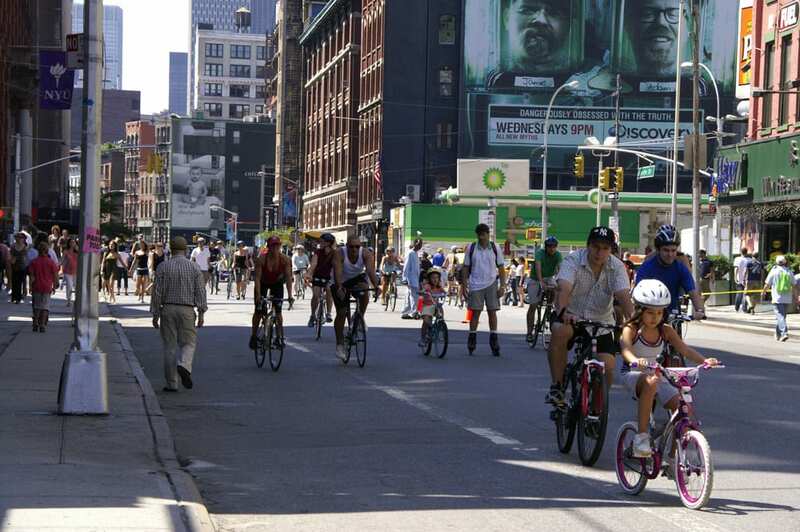 The idea is to let everyone have a chance and to get a constant supply of bikes coming back. Within 20 minutes, we were on street bikes and heading uptown. The hour is enough time to go the majority of the route, but left no time to visit the entertainment venues, so next year, our own bikes go in with us. We did have a great time and the bikes provided were quite good. To promote safety, the DOT has a “free helmet” program where you sign up and receive a brand-new helmet along with assistance in getting it correctly fitted. 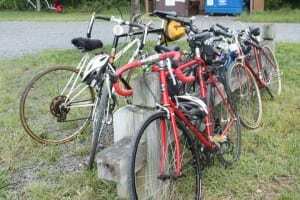 There are free bike repair areas and places where they provide training on how to ride. 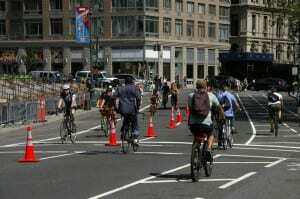 The whole experience is very bike and pedestrian friendly. Thanks, Tim and Norma, for sharing this! Three Chinese citizens are cycling across the country, from New York City to San Francisco, to highlight the plight of artist and activist Ai Weiwei and 2010 Nobel Peace Prize winner, Liu Xiaobo, both imprisoned by the Chinese government. 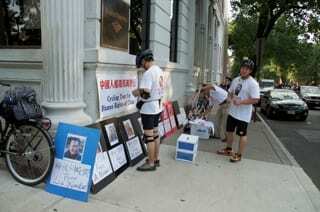 The cyclists stopped in Princeton on Friday evening, June 17, and spoke with people on the corner of Nassau and Witherspoon Streets. 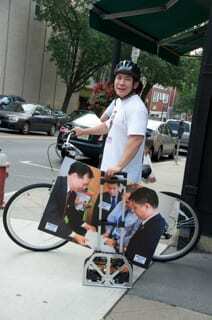 To read more about the “Cycling Tour for Human Rights of China,” go to the Initiatives for China website. 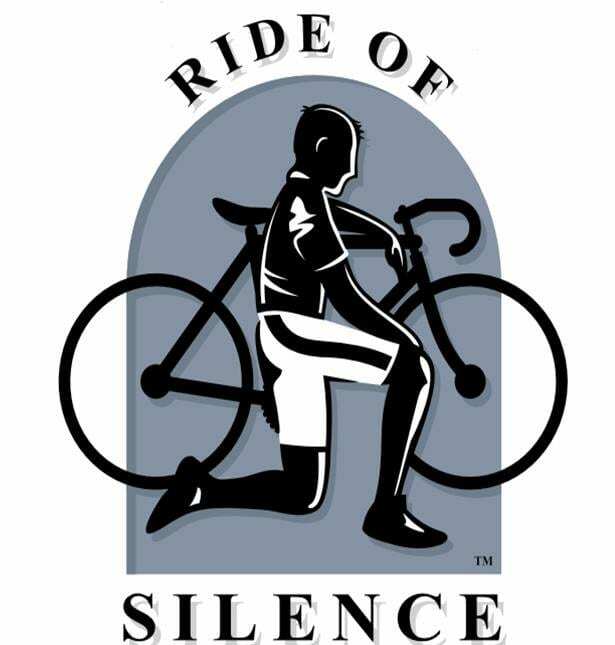 Our rained-out Ride of Silence will now take place on Wednesday, June 1. It’s one of three events planned for the first days of June. A Ride of Silence is a one-hour, 10-mile ride (in silence) to honor those killed or injured while cycling on the road. We are thrilled that we will have both a West Windsor police officer and a hearse from Mather-Hodge Funeral Home in our procession. Thanks! The ride leaves at 7 p.m. from the Municipal Center parking lot, so please arrive by 6:45 p.m. so we can start pedaling on time. Bring lights, reflective vest if you have one — anything to help make us even more visible! We of course will be obeying all traffic rules. This ride is about promoting safe riding practices, courtesy and sharing the road. In addition, we are holding a “yoga for cyclists” class with instructor Nancy Sheehan at the Cranbury Library off Main Street on Thursday, June 2. The session starts at 7 p.m. We’ll talk first about fun places to ride in the area (what’s your tip?) and then get into our deep stretch. The May session was great; join us this time! 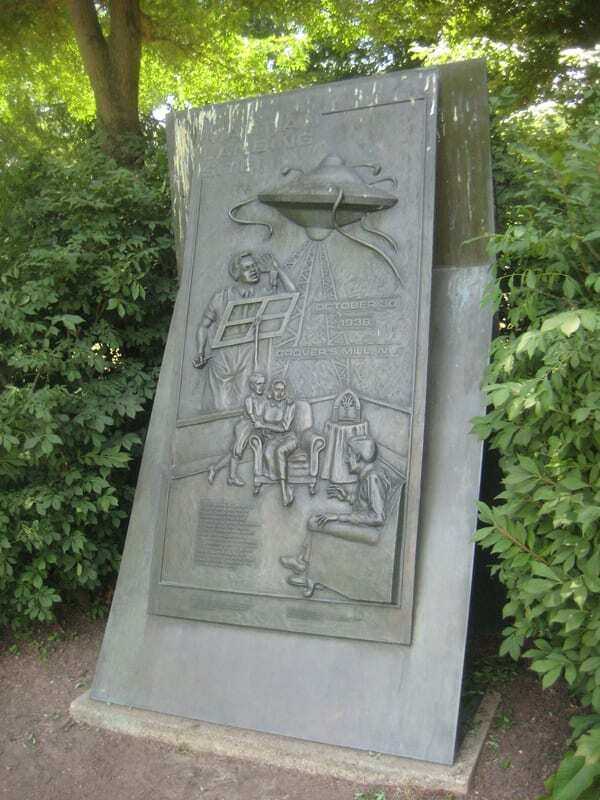 On Sunday, June 5, we’ll be visiting the Metz Bicycle Museum in Freehold. 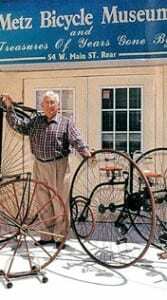 The museum houses one of the world’s finest collections of antique bicycles, dating from the 1850’s to the 1950’s. Hundreds of bicycles are artfully displayed. 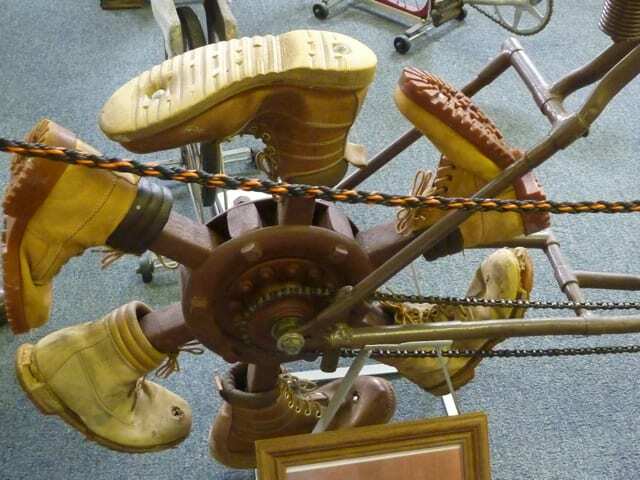 Boneshakers, highwheelers, quadricycles, tricycles, ordinaries, safeties, children’s bikes, trick bikes, and many more unusual and one-of-a kind cycles make up this fascinating collection. See a lamplighter bicycle that is over eight feet high as well as miniatures made by a prisoner of war in Belgium in the early 1940s. We will be riding there from Marlboro High School on Route 79 (NOTE CHANGE from the Bicycle Hub in Marlboro, NJ), starting at 11 a.m., and using the off-road Henry Hudson Trail for most of the 6-mile route. This leisurely ride is free, but museum admission is $10. 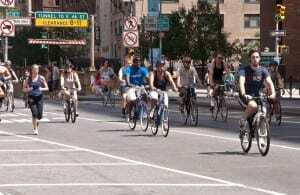 You must RSVP for this ride because of the museum’s capacity; email wwbikeped@gmail.com. We’ll also be at the West Windsors Farmers Market on June 4; see you there? It’s official: 14 West Windsor Bicycle and Pedestrian Alliance members are participating in the annual Anchor House Ride for Runaways, which benefits the Anchor House teen shelter in Trenton, among their other programs. This year, the week-long 500 mile ride starts in Jamestown, NY, not too far from Lake Erie, and finishes as always at Quaker Bridge Mall. After clicking to the Anchor House site, just choose among our members by clicking the dropdown list and scrolling down to find your favorite member rider, then click Donate in This Participant’s Name and follow the instructions. Thank you!